Recently I attended the monthly meeting of InterCom, the organization for professional communicators in SW Michigan. InterCom has become a must-attend for me in recent years because of the quality and variety of the monthly programs. March’s meeting featured Renee Shull of integrated play. The couple of short “building” exercises she had us do using Lego blocks was certainly fun. It was also revealing as she explained the use of the small blocks as a metaphor for our perceptions about success and work. But what particularly struck a chord with me was when she talked about the need to remake herself after a career in corporate HR and how it led her to working with former NFL, NHL, MLB, and NBA athletes. Renee has built her business on helping former athletes and others create successful transitions from their current career to whatever comes next for them and their families. As she pointed out, some professional athletes have a relatively short career and in their 20’s or 30’s realize there is going to life after the playing field or arena. The average NFL career is 3.5 years while the average in the NBA is 4.8, the NHL is 5.5, and MLB is 5.6 years, so it’s clear that most professional athletes are going to need to do something else at a relatively young age. Long-lived playing careers, such as Derek Jeter’s 20 years as the New York Yankees’ shortstop are unusual to say the least. Thanks, Renee, for a fascinating and fun InterCom meeting. And best wishes for continued success with integrated play. For the rest of us, this is a good reminder to keep working on Skill 8 – Growing Yourself. Whenever we see performance problems the culprit frequently involves expectations. Someone’s expectations about what was to happen did not get met. Those might involve results, behaviors, communications, relationships, or a combination of unmet expectations. Expectations are often unstated or implied, the person “expecting” certain behaviors or results rarely has been explicit about the specifics of the expectation. Far too often the offending party has no idea what they have done wrong, and when an expectation goes unmet for days, weeks, or even months, the relationship sours, perhaps to the point of somebody losing their job. Employees have expectations about how their manager communicates with them. Managers have expectations about when an employee needs to ask for input or permission and when the employee can act on their own. Customers have expectations about the relationship with your organization, including how and when you will communicate with them. Peers and co-workers have expectations about the relationship and communications between you and them, as well as between your unit and their unit. These are just a few examples of typical expectations; you can easily come up with others. And there may be expectations unique to your own organization. Yet time and time again these kinds of expectations are not communicated to the key people you work with every day. What would happen if you sat down with your boss, your employees, your peers and had a real conversation about expectations? Do you think it might help people work more cooperatively, more positively, more successfully? Who should address or resolve this issue? – you, somebody else, or nobody? How important is this to me? Is this mission-critical to my job or not so important? What is the best use of my time, talent, and energy right now? Handling this particular issue or something else on my plate at the moment? I’m certain you have issues you can make decisions about, otherwise known as your “span of control.” These are decisions you can make on your own, choosing what seems best to you. For example, if something is within your span of control, you may decide to move ahead and keep your boss in the loop after the fact. If the issue requires sign-off or approval from your supervisor, then it clearly is not in your span of control; it’s in somebody else’s span of control. You also have issues, challenges, problems, and concerns that you have some influence over, whether you realize it or not. This is your “sphere of influence.” These issues are outside your span of control; your position and authority don’t allow you to simply decide what to do. In this case you need the approval of someone else or the willingness of your boss to carry things forward. These issues tend to be things you care about and would like to see changed, but are outside your direct ability to make happen. So it pays to get good at raising issues, communicating critical information, and making recommendations so you can influence the person who actually can make the decision to make their choice the way you would like to see it made. Need a lot of data or just a general overview? Prefer to discuss your idea or issue, see it in writing, or receive it electronically? Have a more receptive time of day? Need to perceive any new idea as their own? This is all about your ability to influence the future direction of your team or unit. The goal is to provide your manager with the information needed so their decision will go the way you want it to. Obviously, you need to provide your boss with information that’s truthful and complete. You don’t want to leave out an essential piece of information that could prove to be a problem later. That would brand you as someone who doesn’t think things through very well. Still, you can craft information and recommendations in such a way that they lead logically to the conclusion you prefer. 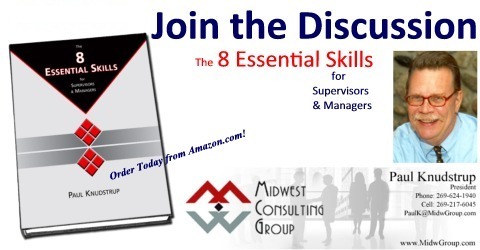 Often, supervisors and managers are frustrated by an issue or problem outside their span of control. So they toss the issue to their boss without thinking about how that person prefers to get input. When their boss ignores it, rejects the idea or makes a decision they don’t like, the frustration continues. What is the real problem or issue? How can I best describe it so my boss understands the essential facts and generally sees the issue as I do? What specific outcome do I want? If this issue was in my span of control, what would I decide to do? What will be the benefits of following my recommendations? What will the payoff be to the organization and its customers or stakeholders? Who else supports my recommended approach? Expanding both your span of control and your sphere of influence is a natural byproduct of experience. As you become more adept at managing yourself and the assignments, challenges, and opportunities that come your way, you “graduate” (David Allen’s apt term) and get to take on new, higher-level challenges. Because of the confidence you develop in your own abilities, this growth process can continue as long as you’re alive. But you have to start somewhere and where you are right this moment is a pretty realistic place to begin. What issues are really within my span of control? What issues are in really within my sphere of influence? Once you’ve identified the issues that are within your particular area of responsibility, then it’s a matter of choices – what are you going to do to move those issues forward to a successful resolution, and what issues do you choose to defer (maybe) until later? Then once you’ve identified those issues that you care enough about to want to see move forward, then it’s a matter of who, how,and what – who needs to know about this particular issue, how do you want them to move forward, and what would you recommend they do? I recommend you really think about it. What’s within your span of control and what’s within your sphere of influence? Think about it and commit yourself to making good choices. Choose well and you’ll see your sphere of influence and your span of control expand. Recently I gave a brief talk to InterCom, the regional group for communications professionals. The topic was collaborative organizations, using our Midwest Consulting Group as a model. We believe MCG is the oldest virtual corporation in Michigan, and probably one of the oldest in the U.S. Building business through collaboration is what we have been about since 1990. The bright, diverse, neat-to-hang-out-with people who make up MCG are involved in both individual and collective projects and collaborating has become part and parcel of how we operate. Clients and projects may differ considerably, but working, thinking, planning together has become part of our hardwiring. The common denominator is helping organizations, individual professionals, and teams get great at what they do. Whether it’s helping a nonprofit agency to create a strategic plan, guiding a university faculty member through the process of publishing in an academic journal, helping create a brand identity for a business or nonprofit, coaching executives and professionals, teaching and training people to be better supervisors, managers, and leaders or creating a comprehensive management development program . . . the commitment to collaborate, cooperate, and help each other grow our businesses is in everything we do. Who are you collaborating with? And what have you achieved through collaboration? Would be an interesting discussion, I think.